Today I have two pieces to share - although one of them you'll be sick of seeing very soon. I think it is due to make an appearance on the next 2 posts as well as this one... 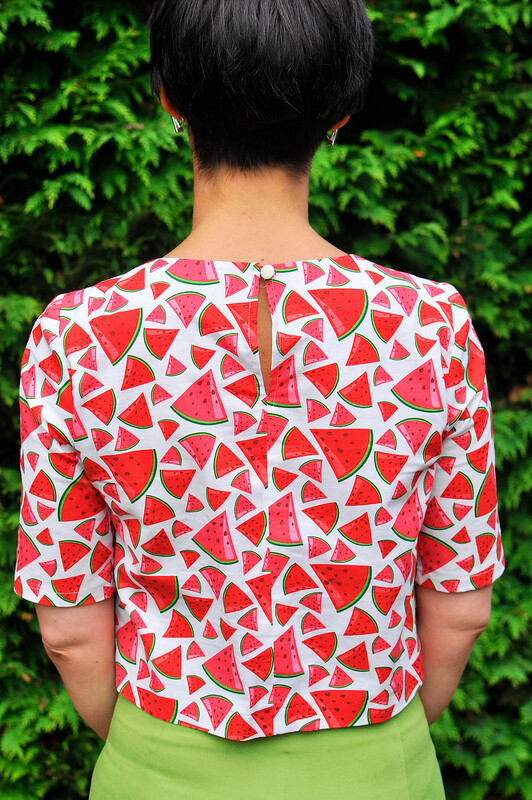 Fans of novelty watermelon prints will be pleased. That's all I'm saying. Anyway, the first item I want to talk about is my Sew Over It Ultimate Trousers - which I've been putting off making for over a year and I really shouldn't have. Trousers are actually not as scary as I thought they were. I finished it in May but because of the give in the fabric, it was enormous on me. I'd better insert a disclaimer here because I don't think I know enough about the fitting of trousers - or anything else, for that matter. To my mind, if it is comfortable to wear and flattering, that's all I care about. Lines, wrinkles and stuff like that mean absolutely nothing to me. The pattern is for fitted, high waisted trousers. I love the way they look and I'm fairly happy with the fit now. I still have a lot to learn though. I made a size 10 but, as I said before, I had to take the sides in by about 2cm on each side. However, the non-stretch version I made (unblogged) is a little on the tight side without any alterations, so the stretch of this fabric must be a factor. It fits way better now but it's a bit tight on my lower legs. I've recently learned my calf muscles are huge in proportion to my skinny legs, so that's an adjustment I'll have to get used to making. They're also a little shorter than I'd like, but that could be a problem stemming from the tight calf, so the trousers don't hang as they should. I'll probably still add some length next time. Instructions were brilliant as usual. I'm signed up to the online class and there are lots of tips and advice for fitting there. The fabric is a stretch lime green cotton twill from Fabworks. It's quite weighty but soft and nice to wear and to sew with. They could be better but I'm still pretty happy with how these trousers turned out. I'll definitely give them another whirl since they're easy to put together and I like how they look. Now let's talk about my new top, which I absolutely love and will be making a crap tonne more of! I have lots of high waisted skirts and trousers and sometimes I just don't want to tuck stuff in. So I've been on the look out for a good cropped top pattern for a while. 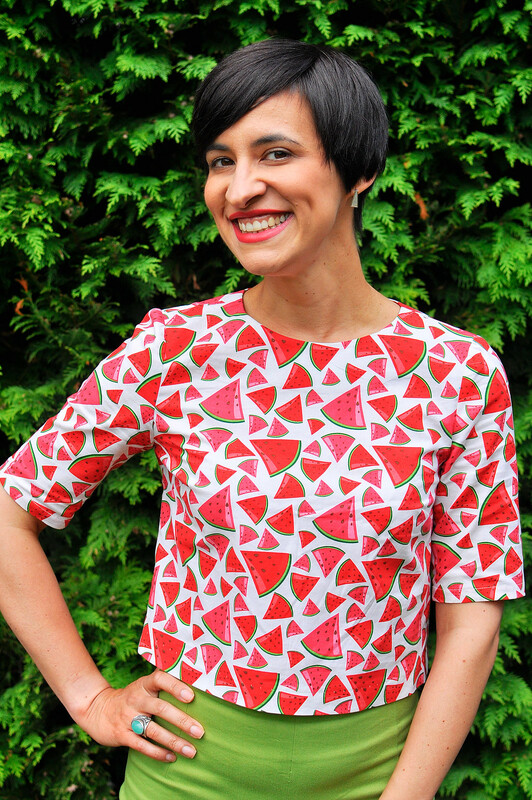 When I found Butterick B6175 for 50% off, it was a no-brainer. Perfect! This is a great little pattern. It's super simple but there are lots of options for customising it: a collar, different sleeve styles and even a scalloped hem. I made version B but with the fitted sleeves from C.
I made a size 8 but I think next time I'll go with my usual 10. It fits fine but it's a tiny bit snug around the shoulders and back. When I read semi-fitted, I thought it was going to be a little looser than it is. I cut the pattern as is and I knew I'd have to take some length off the bottom. When I tried it on, before hemming, I decided to take 2 inches off. I then sewed an invisible hem with my machine and I love the finished look. Much nicer than a traditional turned up hem would've been. The instructions were very good and it only took me about 2 or 3 hours to sew it up. Without the sleeves it would be done in a couple of hours or less. A very easy, quick and satisfying project. The pattern also has excellent stash-busting capabilities: I managed to squeeze it out of less than 90cm of fabric! Speaking of which, the fabric is a cotton that I bought from Sew Over It ages ago. Lisa made a skirt with it last year and I thought it looked fab. It's very summery and I love the colours. I suspect I'll be wearing this a lot.